A tasty treat perfect for your Halloween Party. 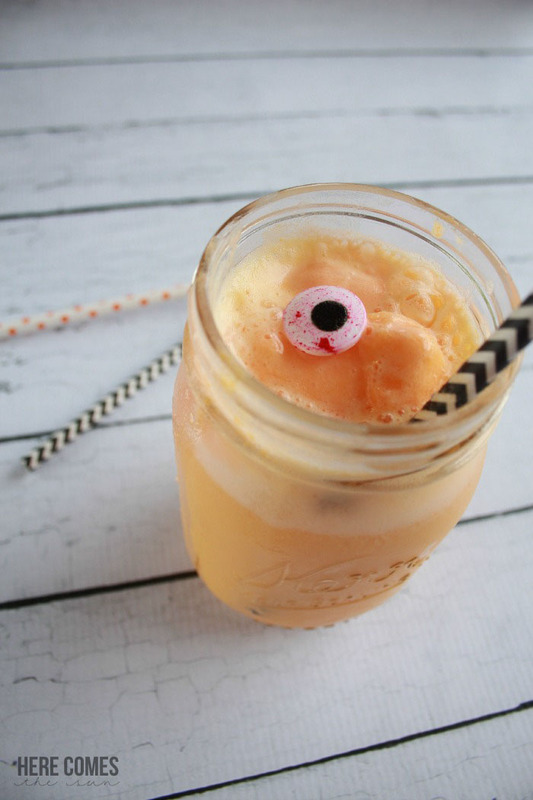 Orange Creamsicle Halloween Punch. Halloween is so much fun, isn’t it? I love all the decor and costumes and of course the parties! I’m a party fanatic and love to create party themed food and drinks. 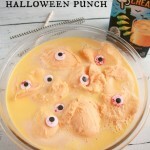 This Orange Creamsicle Halloween Punch is going to be the perfect addition to my party this year! Wanna learn how to make it? First, get a hold of some TruMoo Orange Scream milk. This is a limited edition and is only available during Halloween season. And here’s the great thing about this milk….not only does it taste like an orange creamsicle (YUM! ), it doesn’t contain artificial growth hormones or high fructose corn syrup. That’s a win for mom AND the kids! Add edible candy eyes to the top. To serve, ladel the liquid into a mason jar and top with a scoop of the ice cream and an edible eye. The kids are going to love this! Make sure to save some for yourself! 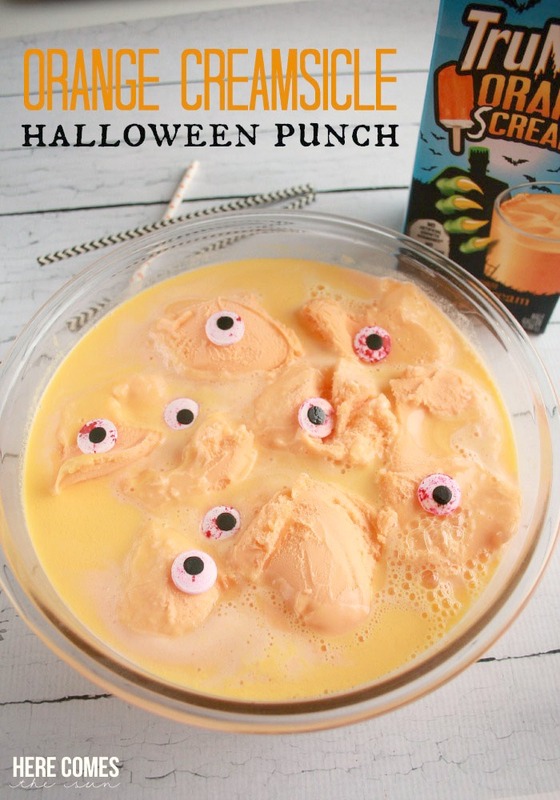 This punch will be guzzled down by the kiddos before you can say Happy Halloween. Can’t get enough of TruMoo? Follow TruMoo on Pinterest for more delicious recipes and enter the Facebook contest for a chance to win weekly cash prizes through October 31! You can also enter the TruMoo Sweepstakes for a chance to win a family trip for four! Oh my goodness, this is such a fun idea! Love it! Thanks so much, Ashley! It was fun to make and delicious! This sounds delicious! I love this kind of sherbet punch and you made it super spooky with those eyes! My kids would love this! It is very delicious. Sharon. I love sherbet punch. It is so easy to make. This is perfect for Halloween! My kids would love it! So festive! 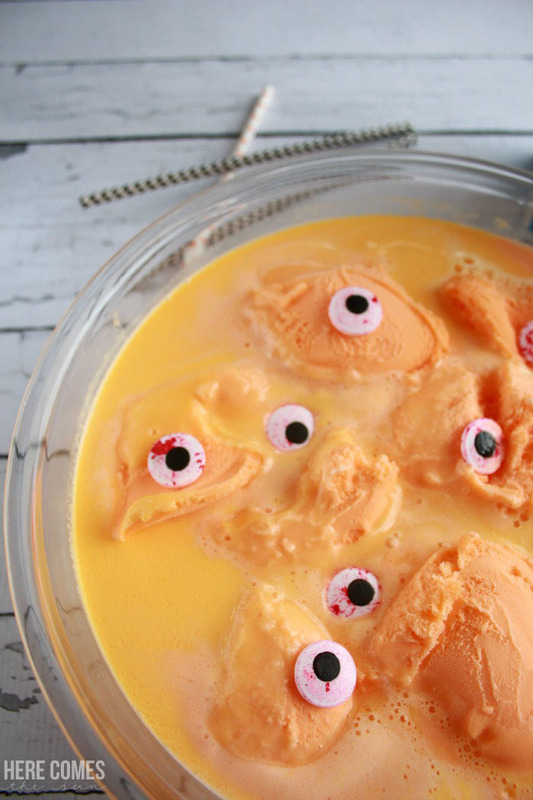 My husband’s B-day is Halloween so I’m always on the lookout for fun things to make for the party! What a fun day for a birthday! No stores in my area have TruMoo Orange Milk (I never even heard of it before reading this). What could I substitute for it? I found another punch that used Kool-Aid, but I figure the 7UP and sherbet have a lot of sugar as it is so I’d rather not use sugary Kool-Aid on top of that. I’ve made a version before with just the 7 UP and sherbet. It’s a bit more foamy than this recipe but would still work great for Halloween.